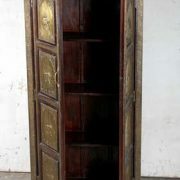 Cabinet made to fit an antique door with original pin hinges and hand carving. Made by creating a cabinet body to fit around a reclaimed antique door, this cabinet allows the time worn character of the door to live on. The door itself is very old and still has the original pin style hinges which, alongside its aged finish, give it a very rustic and unique feel. The door is framed by reclaimed hand carvings, intricately patterned to further the visual appeal of the piece. Behind the door is a generous cupboard space with one internal shelf, finished in a darker brown stain. The hardwood top and sides of the piece are finished with a very subtle whitewash that binds the older door with the reclaimed materials used to build the cabinet’s body. 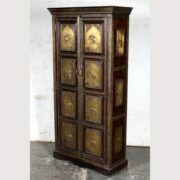 A very interesting and special piece, this medium sized cabinet could be used in a bedroom, living room, hallway or landing.